When you’re multitasking like mad, a standard-aspect-ratio monitor can’t provide enough real estate to display every open window without many of them overlapping and obscuring one another. For this reason alone, most Macworld editors and designers use more than one display. Constantly rearranging multiple browser, text editor, chat, and photo-editing windows as you search for the one you need saps productivity and invites frustration. But using multiple displays isn’t a panacea, either. First, you need a graphics card that can meet the demands you may have for two displays. Second, multiple video and power cables add clutter to your work environment. Third—and most important—a gap between the displays is inevitable, no matter how carefully you arrange them. Even the narrowest bezel creates a blind spot as your mouse pointer crosses from screen to screen. The new 29-inch, ultrawide displays featured here—each delivering a resolution of 2560 by 1080 pixels on a single screen—are designed to take the place of two smaller monitors. Using one longer monitor instead of two smaller ones lets you use a single connection from your computer and removes the problem of pesky bezels that break your concentration as your eyes scan from left to right across the screen. Ultrawide displays are just the ticket for productivity apps, and they’re not bad for gaming, either. Four ultrawide displays recently passed through our Macworld Lab: the Dell UltraSharp U2913WM, the AOC Q2963PM, the NEC MultiSync EA294WMi, and the LG 29EA93P Ultra-wide IPS Monitor. Each display measures 29 inches diagonally and has an aspect ratio of 21:9. That’s much wider than the 16:9 and 16:10 aspect ratios you’ll find on more-conventional monitors—and of course vastly wider than the 4:3 aspect ratio that old-school displays deliver. Each of the models I evaluated incorporates a high-quality IPS (In-Plane Switching) LCD panel that delivers a very wide range of acceptable off-axis viewing angles (an especially important feature when you’re dealing with an ultrawide display). And each screen uses environmentally friendly LED backlighting, which shortens warmup time, lowers energy costs, and reduces the quantity of damaging chemicals that eventually find their way into landfills at the end of a product’s useful life. 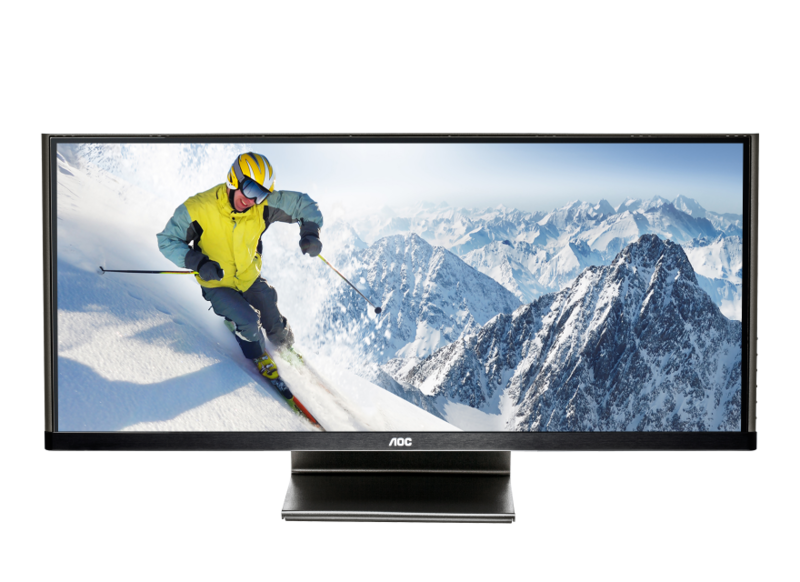 The Q2963PM ( ) is one of the most full-featured displays in the group, providing DisplayPort, DVI, HDMI, MHL, and VGA connectivity. Text on the Q2963PM was crisp and clean, and games and movies played smoothly; but it rendered stark whites with just a hint of yellow. You won’t want to use this display for tasks such as photo editing where color fidelity is essential. The stereo speakers on the Q2963PM are poorly located on the left and right sides of the base, behind the center of the display. They don’t sound terrible, but they emit sound parallel to your ears instead of toward them. You’ll be happier with the audio from even the most modest set of desktop speakers. The Q2963PM’s stand supports little in the way of ergonomic adjustment: There are no options for adjusting the height, for pivoting, or for swiveling—and it allows just a few degrees of tilt. The Q2963PM has a lot of non-Mac related features. MHL (Mobile High-Definition Link) pernits mirroring of Android devices (AOC provides the necessary cable). The monitor also supports DisplayPort 1.2 multistreaming, which allows you to chain several monitors together—as yet, Macs don’t support this feature. And AOC’s bundled, PC-only Screen+ software lets you divide your screen into multiple zones. 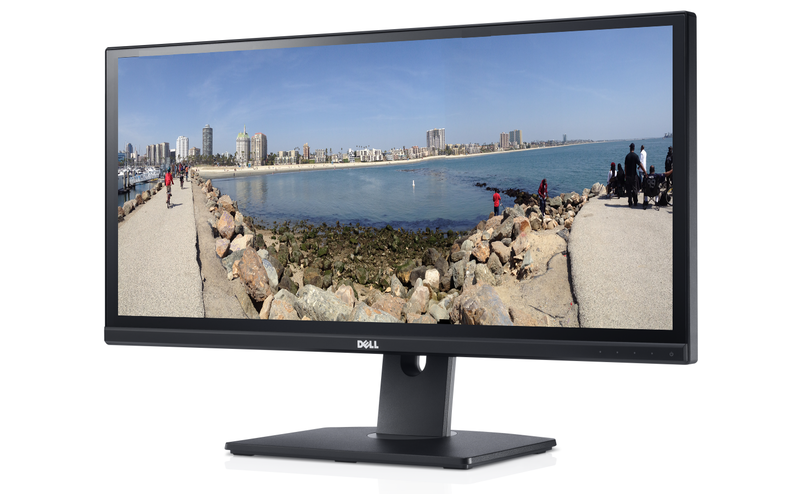 Dell’s UltraSharp U2913WM ( ) offers a generous amount of ergonomic flexibility, with several inches of height adjustment and a stand that both tilts and swivels. The monitor has all of the inputs you’re likely to need: DisplayPort In, DisplayPort Out, dual-link DVI, Mini DisplayPort, HDMI, and VGA. You’ll also find a handy USB 3.0 hub for connecting peripherals such as mice, keyboards, and external hard drives. Dell provides a Mini-to-Standard DisplayPort cable and a USB 3.0 cable in the box. The U2913WM’s IPS panel afforded great off-axis viewing, with very little color shift as my eyes moved left or right from the center of the screen. Colors were saturated and looked pleasing, once I figured out how to turn off the annoying Autocolor feature that tries to optimize the screen settings according to the application being used. I found Autocolor to be a little freaky, to be honest. After looking at a test photo, I clicked a browser window—and the whole screen turned a pinkish color. When I tapped back to Photoshop, the colors returned to their prior values. On a display designed for multitaskers, having automatic color shifting turned on by default seems distinctly odd. On the positive side, text was easy to read, even at small font sizes, and movies and games played back smoothly. When I ran DisplayMate’s black-screen, stuck-pixel test, I encountered two stuck subpixels: one blue and one red. They weren’t in the same area of the screen, and I could detect them only when running the test screen. Dell’s website has details on how it handles displays with stuck pixels. 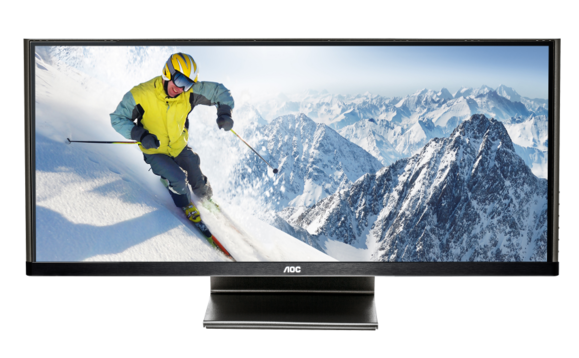 NEC’s new ultrawide display, the MultiSync EA294WMi ( ) uses LED backlights, a high-quality IPS panel, and multiple inputs. But what sets it apart from its ultrawide rivals is its exceptionally flexible stand, which offers height adjustment, tilt, and swivel capabilities and can even pivot into a very tall portrait orientation. The EA294WMi provides five types of connections: DisplayPort, single-link DVI-D, dual-link DVI-D, HDMI, and VGA (two ports). The display comes with niceties like a four-port USB 2.0 hub and integrated speakers. The speakers sounded okay and would be perfectly fine for playing system alerts; but for listening to music, I preferred the sound from my MacBook Pro’s internal speakers. Using various test images on both Mac and PC systems, I found no stuck or dead pixels on the EA294WMi’s screen. Text was clear and legible, colors looked accurate, and grays appeared neutral. I encountered no issues with color uniformity across the wide display. The EA294WMi’s IPS panel, which supports a 178-degree range of viewing angles from the sides and top to bottom, enables the display look great from virtually any screen-facing viewpoint. Even when I pivoted the monitor into portrait mode, colors remained consistent as I moved from side to side of the screen. A 29-inch ultrawide monitor in portrait orientation is extremely tall. I’m not sure who would want to use the screen in this manner on a desktop, but having the option is always nice. The EA294WMi supports MHL, which allows you to connect a compatible Android device to the display’s HDMI port to enjoy the content from your mobile device on the big screen. The monitor doesn’t support daisy-chaining monitors via DisplayPort 1.2, but it does come with a ControlSync cable that lets you control multiple NEC monitors. The 29EA92P ( ) has the most stylish design of the four ultrawide displays I examined. From the front, its thin black bezel looks similar to those on the AOC and Dell monitors; but the back of the case is composed of white plastic, and its edges and stand are chromelike. The stand, though attractive enough, offers a very limited adjustment options, with just a few degrees of tilt. You can’t alter its height, and it doesn’t swivel or pivot. The 29EA93P provides multiple connection options, including full-size DisplayPort, dual-link DVI, two HDMI ports (one of which supports MHL mirroring of an Android device), and VGA. The company provides dual-link DVI, MHL, and USB 3.0 cables in the box. 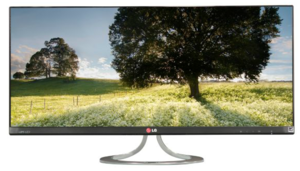 Unlike AOC and Dell, LG doesn’t support DisplayPort 1.2 multistreaming on this model. The speakers integrated beneath the front edge of the screen sound considerably better than the AOC’s built-in speakers. But you’ll be even happier with a modest set of desktop speakers. All four of these displays performed well overall. For folks who want to use an extrawide screen to handle multimedia, the LG 29EA93P, with its decent built-in speakers, would be the best choice. The NEC EA294WMi delivers the most accurate colors and neutral grays, and can pivot into portrait mode—a potentially handy feature for work with signage. The Dell UltraSharp U2913WM is good for users who want to adjust the height and position without using risers. The AOC Q2963PM is a fine monitor, but its colors are a bit lackluster in comparison to those on the other displays, and its speakers are very poor. LG's 29EA93P is stylish and it's equipped with pretty good speakers (for a monitor, that is).